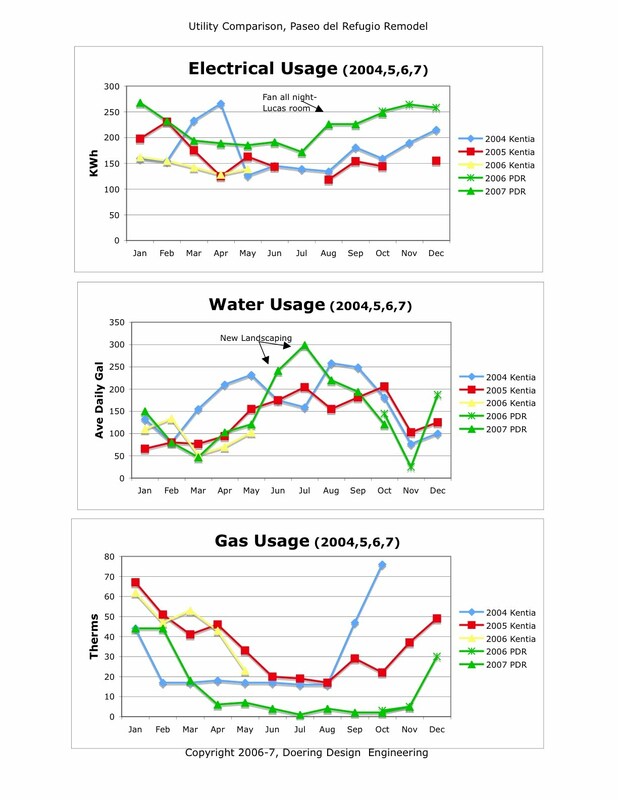 For our house remodel we really wanted to have a better idea of the results or impacts of our energy efficient improvements. We needed a tool that could (a) help us learn by trial and error; and (b) give us data-based feedback on specific design improvements. This is why we developed our own thermal simulations - which provide both of these capabilities. Since we were remodeling we had certain constraints on our design. For example, our North wall was going to stay 2X4 framing while the rest of the house would be 2X6 framing. We opted for the larger framing so we could obtain a higher R-value in the walls. We did have great southern exposure and wanted to maximize that by capturing and holding the incoming energy of the Sun. How would we do that with a raised foundation (no cement slab to act as a thermal mass)? Well, we intended to use a new kind of wallboard - phase change wallboard - that is able to hold and release energy over the course of a day. We'll come back to that issue . In the end, our Thermal Simulations demonstrated that for our location, climate and site orientation the windows and insulation would be critical in providing an efficient building envelope. In fact, a well insulated building with high performance windows was our minimum design criteria. 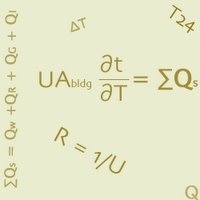 Our analysis accounted for the size, location, R-values, SHGC of all the windows; the types of insulation used in the walls, floors and ceilings; solar insolation at the site; air changes / hour as well as the different types of thermal mass in the house. Our craftsman style house had a lot of wood in the design including the very desnse Acacia wood in addition to the normal furniture, cabinets, tables, granite, tile, etc. Our simulations showed us that this incident themal mass would indeed help to moderate temperature swings in the house. 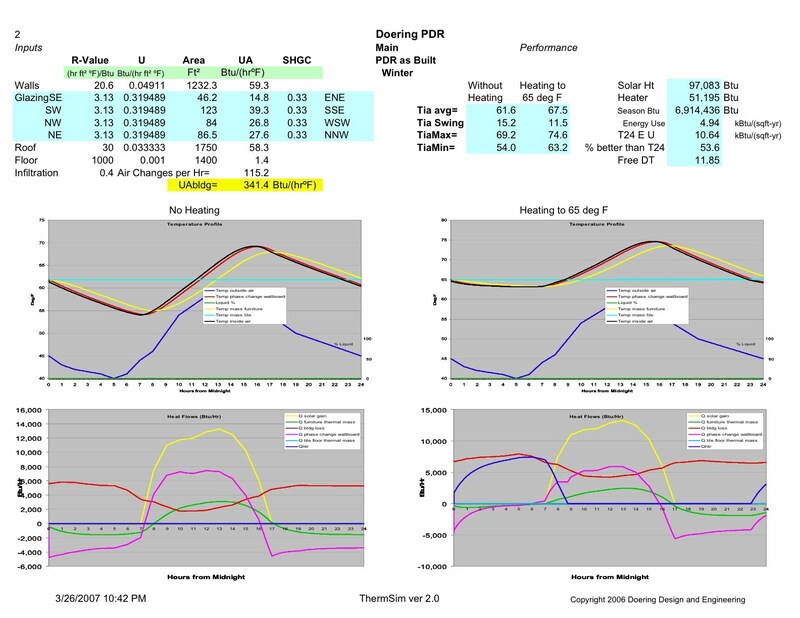 We can look at a few of our simulations for PDR, called "runs" to help demonstrate things. 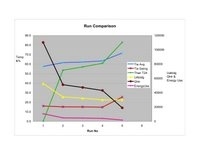 Take a look at the (1) Run Comparison and (2) Detail Sheet below. It is probalby easier to talk about these or answer you specific questions - send an email with your questions. 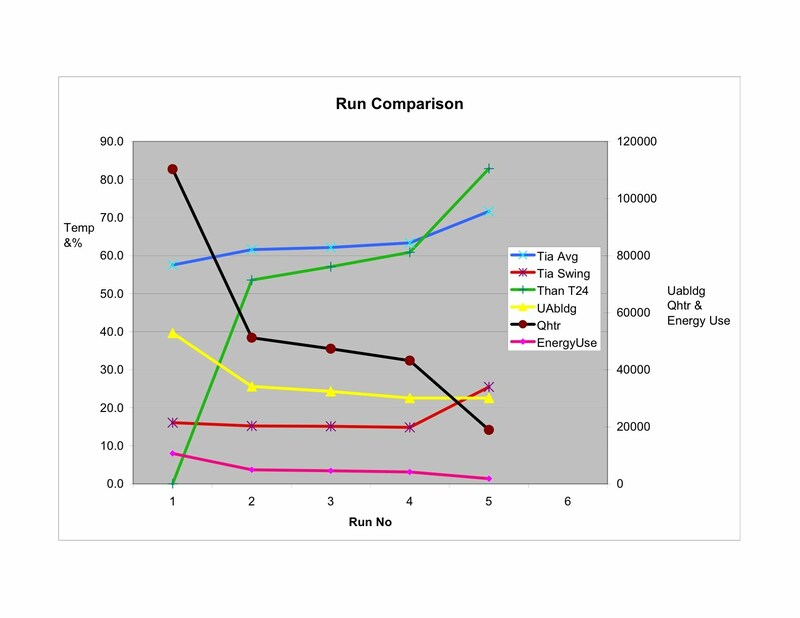 A summary sheet or "Run Comparison" is prepared that graphically represents the relative change in performance of the differnt design decisions. 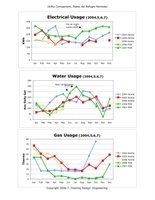 A number of performance metrics are used. A "Detail Sheet" with all the specific run data is created for each design. 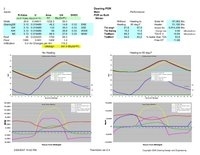 The Details Sheet records all the relevant design decisions; graphs the 24-hour termperature and heat flow (Q) data, and tracks the changes in a critical set of metrics.